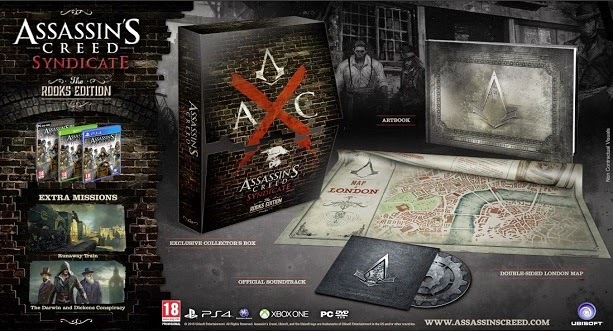 We just covered the Collector's Editions for North America, but as usual Ubisoft has more choices for you to pick from in the UK. Here are the choices you have to pick from! -Double-sided London Map with street advertising on the back. -A high quality art book including concept art that inspired the game. 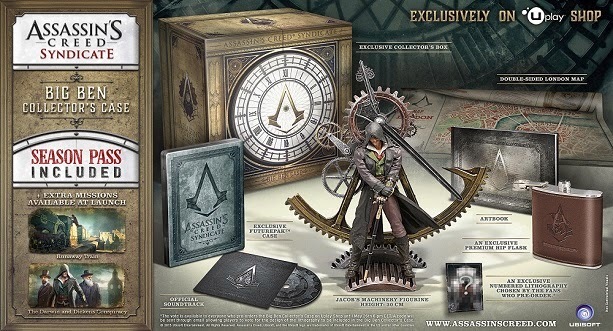 -Exclusive Collector’s Box that will allow you to display your figurine in a dedicated diorama. -A 27cm-high Jacob Figurine standing on a railway track junction. -A high quality art book including concept arts that inspired the game. -Exclusive Big Ben Collector’s Box. -A 30cm-high Jacob’s Big Ben Machinery Figurine. -An exclusive premium hip flask.